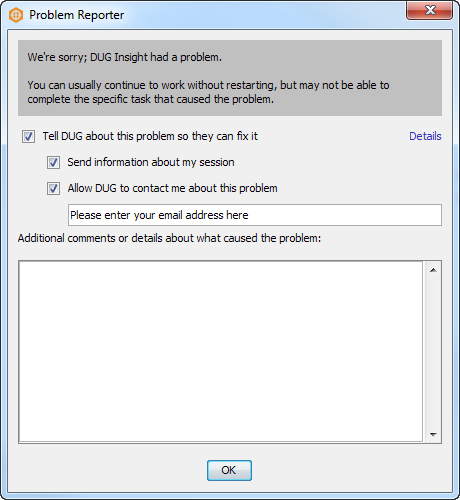 DUG Insight User ManualFrequently Asked QuestionsFrequently Asked Questions Insight Error MessagesHelp, Insight just crashed! What should I do now? When Insight encounters a fatal error, the Problem Reporter window will appear. It allows you to easily send details about the error to us. Note: For a non-fatal error, see Viewing and Sending Diagnostic Logs. Enter your email address and any other relevant information in to the comments box so we can provide a response back to you. This information, along with the contents of the log, will be sent to the support team for analysis. If you want a response from the support team, make sure to provide an email address. Prev: There is a problem. How do I provide information on my issue?